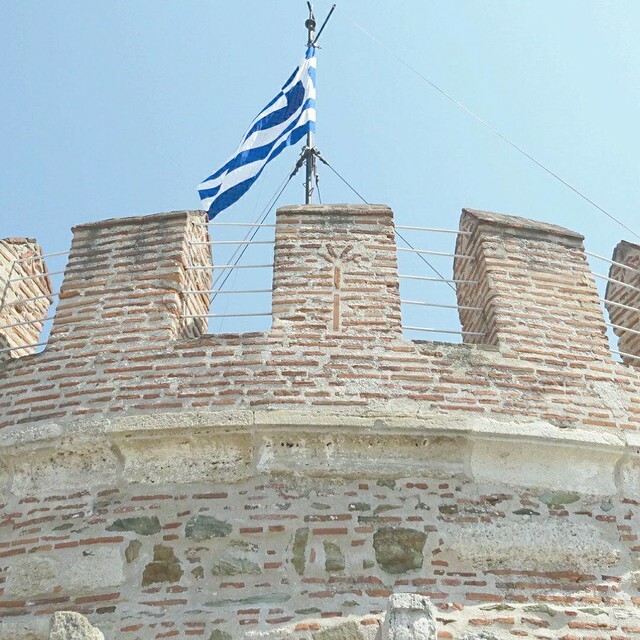 Why you should definitely visit Thessaloniki! May not as well-known as the capital city of Greece, but Thessaloniki is absolutely worth a visit. Thessaloniki shows a lot of similarity with Athens. It has old Roman sites, waiting to be discovered, Greek Orthodox Church, mostly built in Byzantine style, on every corner of the street and an adorable boulevard that’s just perfect to discover by bike. However, beside similarities, there are also some huge differences between both cities. With about 320.000 inhabitants the city is quiet smaller than Athens. Partly because of this, the newer part of the city lies very close to the sea and it’s beautiful boulevard. Also, Thessaloniki has a beautiful old town with colourful houses and a style I have not seen anywhere else in Greece yet. Behind the old town you may find the still remaining parts of the city walls and the old castle from where you can admire a wonderful view on the city. The Aristotelous Square made me think of an beautiful Italian Square although it was designed by a French architect. I always feel like Greece and Turkey have a lot of similarities, probably because they share a lot of history together. In my opinion Thessaloniki is one of the places where you can find many traces of the Byzantine empire as well as the Ottoman empire. It is never possible to describe one city in one sentence without hurting anyone’s feelings. However, I would say Thessaloniki is a very small combination of Athens and Istanbul. The new boulevard of Thessaloniki is an excellent place for biking. During the tour Ben and I got amazed by the beautiful historical treasures off the city and the amazing views. The most impressive monument is the White Tower, the landmark of the city, where we stopped for a climb up. The White Tower was built during the Byzantine empire but mostly used by the Ottomans. Beside a fort, the tower was also used as a prison and during those days it was known as the Red Tower or Tower of Death. Although I like the idea of a White Tower a lot more, I was a bit surprised, as the tower didn’t really seem to be white anymore. The White Tower is one of the reasons I see a similarity with Istanbul. Not that the White Tower looks that much like the Galata tower in Istanbul. But both towers are symbolizing its cities. Since the White tower is not only a monument, but also a museum, you can learn some interesting things during your walk to the top. The view from the top is incredible as you see the historical city and the mountains at one side of the tower and the never ending blue sea on the other part. Beside the White Tower there is, like in many Greek cities, the Alexander Statue which is the largest statue in Greece. The statue is even more impressive when you watch it from the other part, the city part, to the sea. One of the most defining empires of Greek history: The Byzantine empire. After Istanbul, Thessaloniki was the most important city during this period. Not a surprise that we found many traces of Byzantium in Thessaloniki. As the Byzantine Empire was the first empire that was founded on the Church and because of that had an huge impact on the growth of Christianity. 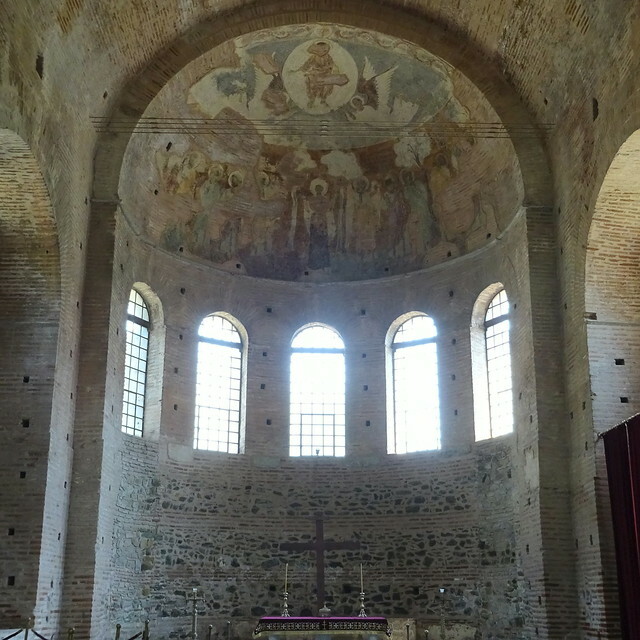 Many beautiful and old churches can be found in Thessaloniki. Most of the older churches later turned in a mosque during the Ottoman empire. There were a few churches that just stole my heart. 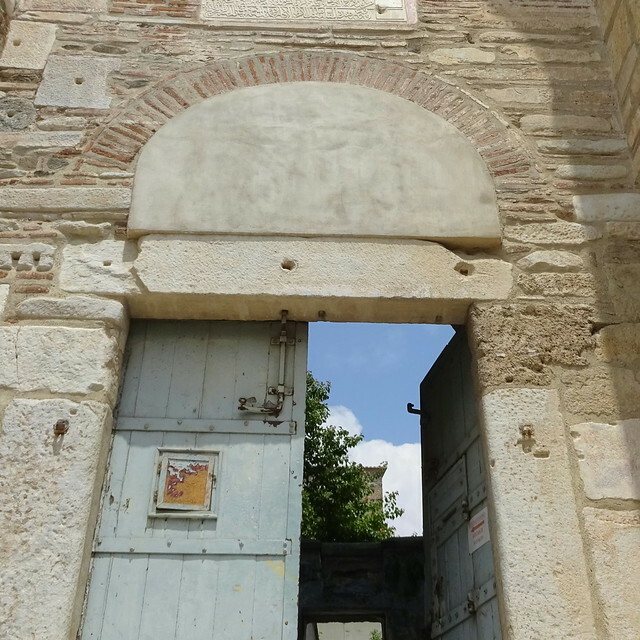 The first one Ben and I visited was the Agios Dimitrios, dedicated to the saint of the city. Huge parts of the church have been renovated, but the old, still remaining parts are beautiful. I think this was even the first time Ben was able to appreciate a church, although it was only because of its historical beauty and architecture. The original intension of the Rotonda Romana is still under consideration. It might was supposed to be a mausoleum or an Roman Temple. I know one thing for sure, walking inside the empty building looking up to the 30m high central dome was quite impressive. As it was turned into a Christian Temple, Christian traces can be found in the decoration of the walls. Also I couldn’t stop admiring the mosaics which I guess are traces from its time serving as a mosque. In any case I wasn’t expecting a to found a beautiful and interesting piece of history during my stay in Thessaloniki. Based on the Hagia Sophia in Istanbul and one of the oldest churches in Thessaloniki, the Hagia Sophia is another beautiful historical treasure of the city. Ben and I walked right into it looking for a supermarket. Without knowing this building I could tell it was an interesting place from the moment I saw it. The church is beautifully decorated with Christian Art. If you are interested in learning more about the Byzantine Empire and the growth of Christianity, as I am, I can really recommend to visit the Byzantine museum in Thessaloniki. The 12 rooms exhibit collections starting from the early days of the Byzantine empire until the Byzantine legacy after the fall of the empire. It is mainly focussed on Christianity and the Christian culture. 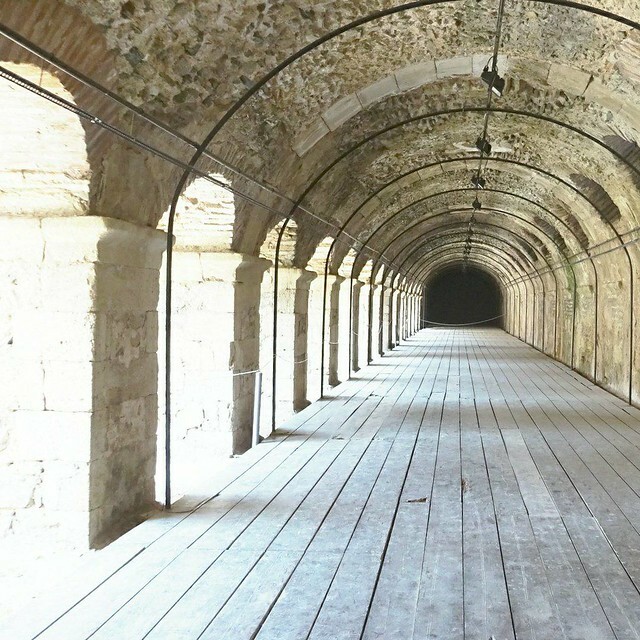 Although the Byzantine Empire had a huge impact on Thessaloniki, there are some more amazing historical monuments to admire in the new part of the City. Starting with the Roman Forum, which used to be the administrative center of the city. I was mostly impressed by the renovated Stoa, the place what we would call the shopping mall in our current days. The Roman Forum is an interesting place and you don’t need much of your imagination to go back in time while walking around. The museums gives a nice overview of the city’s history. More information about the city’s history and the entire history of ancient Macedonia can be found in the Archaeological Museum of Thessaloniki. As Ben and I planned a whole day to spend on museums so we had plenty of time to gain knowledge and admire the historical pieces of art in this museum. The Archaeological museum of Thessaloniki is one of the biggest in Greece. Historical pieces dating form prehistoric times to the late antiquity can be admired in this interesting museum. I honestly learned a lot about the ancient Macedonian history. I personally loved the mosaic artworks, they are my favourite historical pieces of art. But most interesting for as well Ben and me was the skull cast of an early hominid the, Macedonian Ape and the copy of the famous skull of Petralona found in the Petralona cave close to Thessaloniki. As Ben and I both have a different opinion about evolution this always starts an interesting conversation, but luckily we can have an respectful discussion about these kind of subjects as we both believe an open view to your point of view is important. Not really an historical place, but at least the most romantic place in Thessaloniki is the Aristotelous square. It was designed by a French architect in 1918, but it actually made me feel like I was one of Italy’s beautiful squares. I have not seen a square as beautiful as this one anywhere in Greece. As it is located at the waterfront and surrounded by restaurants, it is the perfect place to start your day and enjoy a delicious breakfast. I think this was the most surprising part of the city for me! I had read about the old part of the city, the part that wasn’t destroyed by the fire in 1917, I actually had no idea what to expect. In any case I didn’t expect these colourful houses built in traditional Greek – Ottoman architecture. Actually the houses made me think a bit of mountain houses I saw in Switzerland. The streets are very cute, stray cats are walking around and in-between the houses you can enjoy an incredible view as the older part of the city is located higher. The upper town is dominated by its Acropolis, an Byzantine and Ottoman fort. Ben and I preferred to walk upwards to this famous fort, which gave us the change to walk to the beautiful Old Town. However, once we arrived at the Acropolis it became more crowded and touristic. The view on the city is just stunning and going inside the fort is something I can highly recommend as it is pretty beautiful. As many other Orthodox churches, The Hagia Sophia in Thessaloniki was based on the Hagia Sophia in Istanbul. The cathedral in Istanbul is one of the first examples of Byzantine Architecture and the Hagia Sophia in Thessaloniki is a perfect example of the huge impact the byzantine empire had on Christianity, especially the Greek Orthodox church. The house of Kemal Ataturk, the famous Turkish leader, can be found in Thessaloniki Old Town. This is the house where he was born and raised by his Turkish family. He once was an Ottoman army officer, but later he started his own army and started fighting against the allied occupiers as well as the Ottoman Sultan. The sultanate was abolished in November 1922 and Ataturk was recognised as the new leader of Turkey. His most important reform was the separation of religion and state. Prices for food: Restaurants will cost about €20,- (without alcoholic drinks), A cheap meal will cost about €8,- and a Gyros lunch will cost about €2,50-. Getting around: As Thessaloniki is not quiet big and most attractions are located close to each other the best way to get around is walking. It is also an option to take a bus. You can buy your ticket at the kiosks. If you prefer to take a Taxi, make sure you have the Greek name of you destinations written somewhere. Especially when you are planning to visit the old town, you might prefer taking a taxi. Ben and I walked the whole route, but it’s quiet far. How much Time do you need? Ben and I had 4 full days, which was more than enough to explore the whole city and we even had some time left for shopping and relaxing. Also we planned one day only to visit the two museums (byzantine museum & archaeological museum). There are several, easy ways to get to the city’s acropolis. However, Ben and I took the trough one that goes right through the Old Town. Although it takes a lot more time, it is totally worth walking through these beautiful streets and colourful buildings. 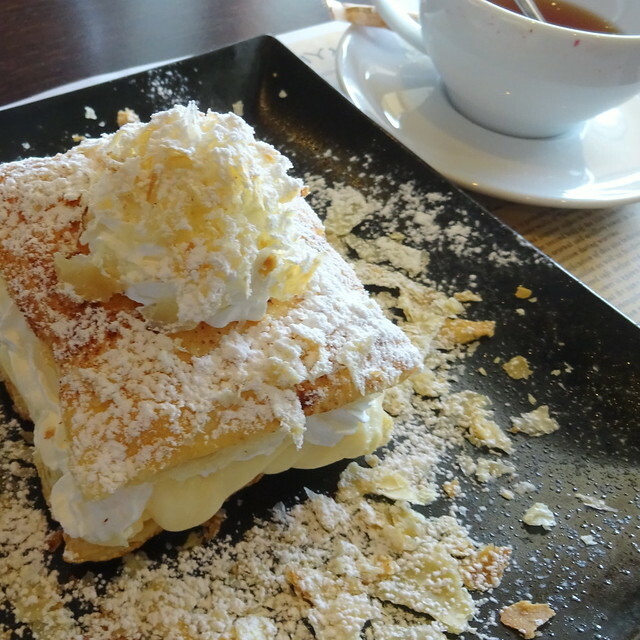 Try a delicious Bougatsa! The origin of this sweet is in the city of Serres, however it is most popular in Thessaloniki. Just imagine a lot of semolina custard in-between some layers of phyllo. The taste of Bougatsa differs at each part of Greece and the Thessalonian one is the most crunchy. Volgend bericht Romantic getaway to an active volcano: Santorini!